Services and Projects The community can find organizations where they can volunteer or join and where they can donate goods, services and funds. They can also find a comprehensive local events calendar as well as search for scholarships. Service organizations can find funding, volunteers and new members as well as donated goods and services. Philanthropic organizations can find a wide variety of community needs from which to choose. Sedona Wish List also has a weekly column in Wednesday’s edition of the Sedona Red Rock News, featuring current needs (Wishes) of member service organizations. All services are free to members and the public. Sedona Wish List has grown to 89 members and requires one or two more creative people to help with Community Relations and with Social Networking. Community Relations consists of speaking with community groups and letting them know how Sedona Wish List can help them. Social Networking consists of regularly updating our Facebook page - and starting other similar pages. There is so much potential for Sedona Wish List with a couple of resourceful individuals. Sedona Wish List has grown to 89 members and requires a few more wonderful people to help with our Red Rock News column, with Community Relations and with Social Networking. If you volunteered before and did not hear from us, we offer our deepest apologies. To our dismay, we discovered only recently that one of our email addresses was not working and we never received your email. Please contact us again. We will be delighted to hear from you! Help Sedona Wish List Grow! 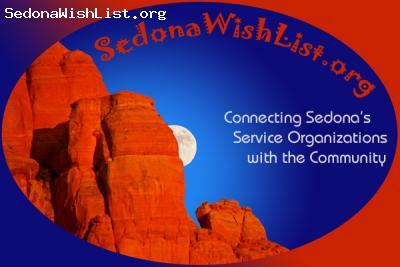 This time, it is Sedona Wish List that is asking for help – an outgoing and organized volunteer who wants varied and fulfilling community service. Meet members of Sedona's wonderful service organizations while helping alert members to their opportunities on Sedona Wish List.